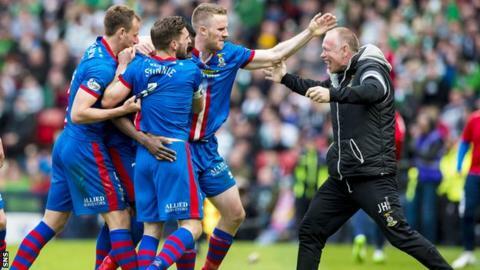 John Hughes has been named PFA Scotland manager of the year after guiding Inverness to the Scottish Cup final. Hughes won the award ahead of last year's winner Derek McInnes, Celtic boss Ronny Deila, and Hearts head coach Robbie Neilson. Inverness CT currently sit in third place in the Scottish Premiership as they push for a Europa League spot. Hughes told BBC Scotland: "It's overwhelming. My emotions are running high because I'm quite a grounded guy." The 50-year-old took charge of the Highlanders in December 2013 after previously managing Falkirk, Hibernian, Livingston and Hartlepool. "I never felt when I took up football - player, manager, coaching - that I'd be picking up the manager of the year award, voted by your peers. "I hope it's a reflection of all the hard work put in by my players and everyone up in Inverness. They're a wonderful bunch. "We're going for Europe and we're in the Scottish Cup final, but I hope they're saying 'they're a right good football team' and I hope that award also reflects the style of football we play." Celtic midfielder Stefan Johansen has won the PFA player of the year award and team-mate Jason Denayer claimed the young player prize. Hibs midfielder Scott Allan, Morton striker Declan McManus and Arbroath forward Bobby Linn took the plaudits in the Championship, League One and League Two respectively.